The 64-year-old judge who presides over the 93rd state District Court, and who is known for subjecting those in his courtroom to oftentimes long-winded, boisterous manners of expression, appeared worn from three days in federal custody and somewhat soft-spoken moments after walking out the front doors of the federal courthouse after posting bond. Delgado, wearing a suit-jacket, tie and slacks and accompanied by attorney Adolfo “Al” Alvarez, declined to answer subsequent questions regarding the allegations that he accepted bribes from at least one local attorney, who told federal agents he had bribed the judge since at least 2008. “In America we have the presumption of innocence and I intend to let the judicial process take its course,” Delgado said as he walked away from members of the media. Asked if he would be back on the bench of the 93rd state District Court, Delgado said he did not know, saying there are “authorities” who may have a say in the matter. Delgado is running for 13th Court of Appeals and when asked by media members on the status of his campaign, he implied he wasn’t certain. The authorities he is referring to are those who are on the State Commission on Judicial Conduct, a state agency tasked with investigating allegations of judicial misconduct, judicial disability and for disciplining judges, according to its website. About five hours earlier the judge, standing before U.S. Magistrate J. Scott Hacker, made his initial appearance in federal court. His hands shackled and wearing only a white, long-sleeved mesh shirt and black slacks, Delgado — accompanied by his second attorney, Fernando Mancias — quietly answered Hacker’s prompts, stating that he understood what was being alleged against him. In support of Delgado and inside the federal courtroom was Delgado’s wife, Diana Delgado. Other family members as well as friends, including County Judge Ramon Garcia, were also present. Hacker, after hearing the government’s recommended conditions for release, agreed to grant Delgado a $100,000 bond, with a $2,500 cash deposit and ordered him to relinquish his passport, avoid excess alcohol consumption, and prohibited communication with any potential co-defendants. Federal agents arrested Delgado on an outstanding warrant Friday afternoon while the judge was traveling outside the Rio Grande Valley. According to the complaint filed against Delgado, FBI agents began investigating him in connection with allegations of bribery in November 2016. Delgado faces one count of bribery concerning programs receiving federal funds, which could land him in federal prison for 10 years, the complaint states. The complaint details how CHS told FBI agents that the pair would set up the meeting by telephone, and that the bribe payment would take place in person — often utilizing “coded” language to communicate regarding the bribe. CHS also told federal agents about two recent instances in the last two years in which a bribe was given, and where Delgado placed CHS’ clients on bond after paying the bribe. “For over a year, CHS has worked with the FBI as a confidential human source. In that capacity CHS participated in numerous consensually recorded phone calls and in-person meetings with Delgado,” the complaint states. 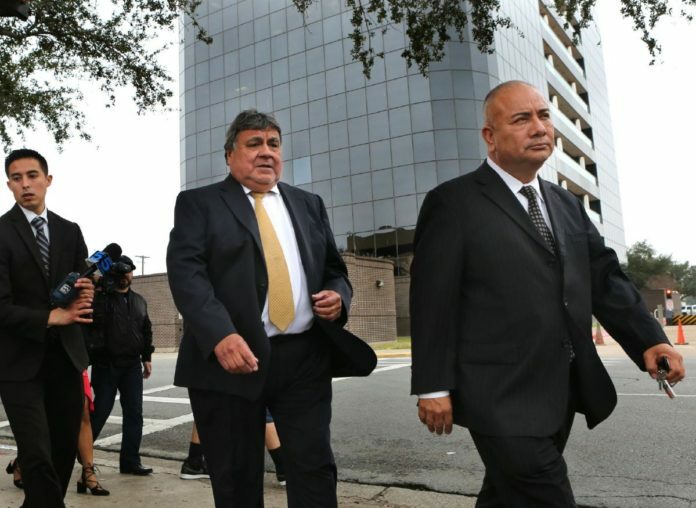 The complaint also alleges that Delgado accepted, at least on two occasions, “prerecorded official government funds,” in the amount of $520 in exchange for favorable judicial consideration on cases in his court. FBI agents state in the complaint that they believe Delgado is attempting to cover up the bribe in the text message sent to CHS. This report was updated to reflect Delgado was charged based on a criminal complaint.